Azza Travel & Tours Pte Ltd was formed in early 1993 to provide better services for the travel industry. The main objective of the company is dealing with selling of airline tickets globally, Group Departures, exotic tours, traveling by coaches, trains, tours with halal meals for Muslim customers and many more. In year 2000 we expanded and opened the Hajj and Umrah (pilgrimage tour) department. We are not concentrating only on Singapore pilgrim but also working hand in hand with our counterparts such as Malaysia and Indonesia. Our motto is: ' Your comfort is our priority ' and we offer quality and professional service for all our customers' travel needs. Flight departs to Helsinki. Visit Sibelius Monument, Rock Church, Uspenski Cathedral (Russian Orthodox Church) and Christmas Market. Transfer from hotel to Tallink Silja Line pier and board the ferry to Tallinn, Estonia. Visit Santa Claus Village (includes certificate for crossing Arctic Circle). 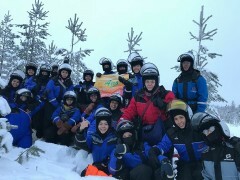 Half day ski activity at Ounasvaara Ski Resort. Aurora Borealis tour at night. 1-hour reindeer ride on the reindeer sleigh. Visit local mosque and Porvoo.